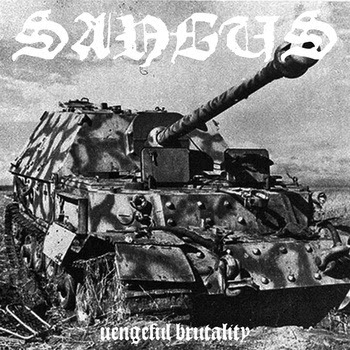 Sangus Legio’s 2013 demo “Vengeful Brutality” is so heavy that it verges on total cacophony. Listeners craving something hectic and brutal will not be disappointed. This album is a disorienting trip in to the filthy, thick, rippled guts of misanthropic violence. That is, the tracks deliver what the title promises. Sangus Legio’s three-track blackened thrash demo reminds listeners of throwing temper tantrums as an angry, small child. Only this time with blast beats and brutal shredding, punching bass lines, and badass guitar solos backing them. The crushing brutality of this black metal crust puts listeners in to a world of frustrated excitement that makes them want to kick and punch their way out of it and climb over piles of cadavers on our way into battle…against everything. Though the recording quality is neither clear nor polished, this feature works in favor of band’s sound. The heavy, gory, filth on “Vengeful Brutality” is muddy and distorted, calling back to earlier days of brutal music, which makes sense when considering that the line up consists in members of Paindriver, Haxen, Sin of Angels, Nachzehrer, and I, Destroyer. The recording of “Vengeful Brutality” makes for a brutality of raw desolation. The guitars of Barbarian and Vamacara, play distorted, loud, brutal riffs and solos—shredding over the splashy symbols and unrelentingly heavy beats of drummer Executioner. The bass lines of Czarnobòg carry the bands distorted mayhem in to some comprehensible form, focusing the total brutality in to a finely pointed weapon of destruction. Sangus Legio’s vocals truly crystallize the bands almost playfully brutal style. Vocalist Vovk’s throaty screaming and gutturals reflect a tradition of black metal, grindcore, and thrash that, if it were ever dead, kicked it’s way out of the coffin for this demo. Over all this demo is consistently heavy, disgusting, and vengeful. Some might, however find it too short to get around to acting out the repressed misanthropic squalor advocated in the short, three-track demo.